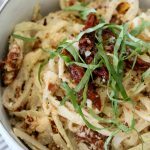 This Sun-Dried Tomato Zoodles recipe from The Whole Smiths is brought to you in partnership with Mann’s Fresh Vegetables. 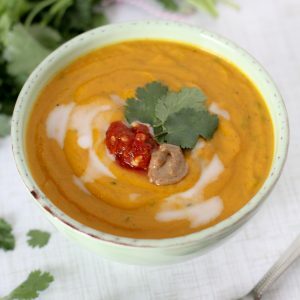 This nutrient dense dish is dairy-free, gluten-free and paleo. Not to mention, delicious! How on earth did we eat our veggies before we started spiralizing them? Oh, yeah… in a can! Or in fairness, we steamed them to death. Thankfully times have changed and we’ve figured out lots of tasty new ways to get our veggies in. Vegetable noodles being one of them. As evidenced by my Pesto + Chicken Zoodles, Pork Fried Cauliflower Rice and the Spaghetti Squash Chicken Alfredo (from The Whole Smiths Good Food Cookbook, you can get yours HERE) recipes, you know I’m a fan of using nutrient dense vegetables in place of grains. But I have to confess, I’m not always a fan of “zoodle-ing” them myself, particularly on a busy weeknight. Thankfully , that’s where Mann’s Fresh Vegetables comes to the rescue. I love the variety of already prepared vegetables that Mann’s offers at grocery stores nationwide. You know I am a fan of making things easier in the kitchen and they do just that. Currently, my favorite veggie of theirs is the Kohlrabi Linguine. In fact, I’m going to go out on a ledge and say that by this time next year kohlrabi noodles will be everyone’s favorite. If I’m being super honest, I haven’t had a lot of kohlrabi in the past. It’s a mild tasting vegetable with a light texture, which makes it the perfect vegetable to replace any pasta. 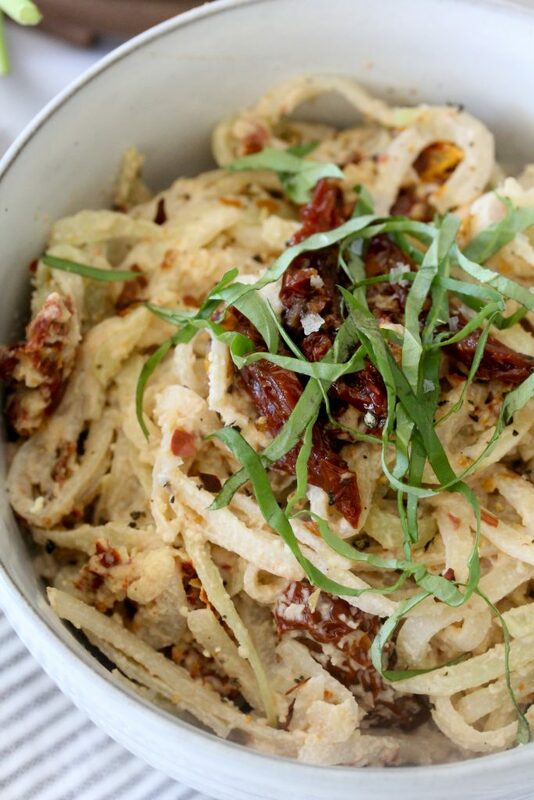 What I’m loving the most about the Kohlrabi Linguine is how well it holds up as a pasta. As you may know, vegetable noodles can often get a little soggy if not properly prepared. Add a sauce on top of that and you’re liable to get a mushy pile of pseudo pasta. 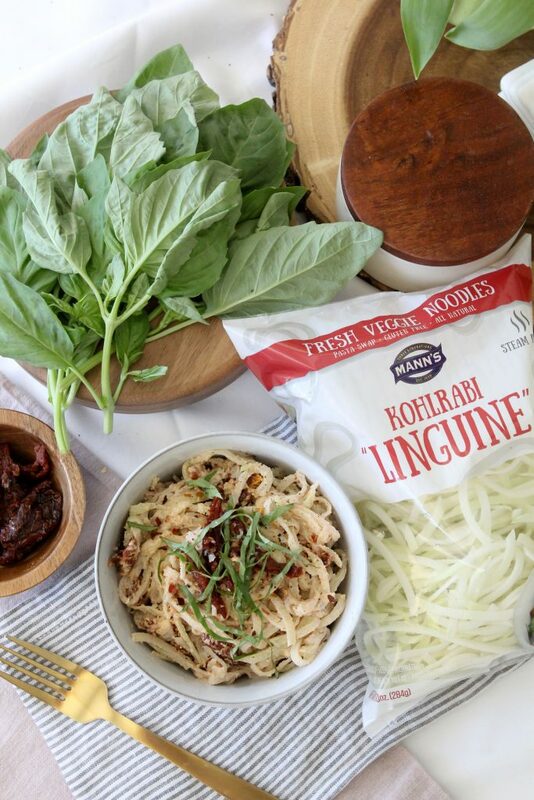 But not with these kohlrabi noodles! They hold their shape, texture and consistency perfectly against any sauce. Making it even easier, all you need to do is microwave them in their own bag to cook them. From there you add the sauce, toss and presto… your “pasta” is ready. 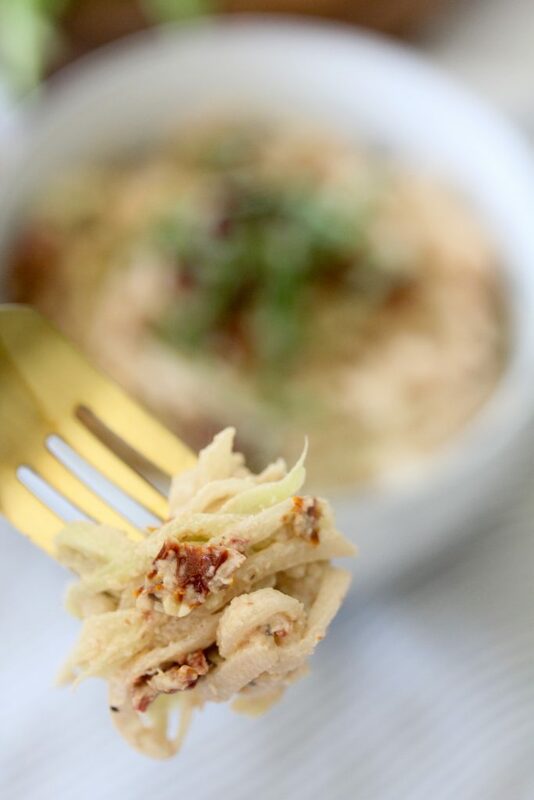 I really wanted to create a recipe for these tasty noodles that had a creamy flavorful sauce that packed a punch, enter the sun-dried tomatoes. When searching for your sun-dried tomatoes make sure to read the labels. Often times you can find less than desirable additives in them and that’s a no-no. I typically use the oganic sun-dried tomatoes from the Whole Foods 365 label. In fact, those ones are so clean they’re Whole30 compliant. So if you are looking to make this Whole30 keep that in mind. Feel free to add your favorite protein like chicken or shrimp to this for a complete meal. A trick that I use when making a dairy-free cream sauce that I am planning to add to a vegetable noodle is that I like to make it a bit on the thicker side. The reason being is that a vegetable noodle is going to release a bit of it’s natural liquid into the sauce and will loosen it up a bit while you are tossing it into the warm sauce. Truly, this recipe has grown to be one of my new favorites! Whether it’s the flavor of the sauce, my new favorite veggie or because it’s just so darn easy to make, I’m not sure. But one thing I do know is that you’ll love it just as much as we do. 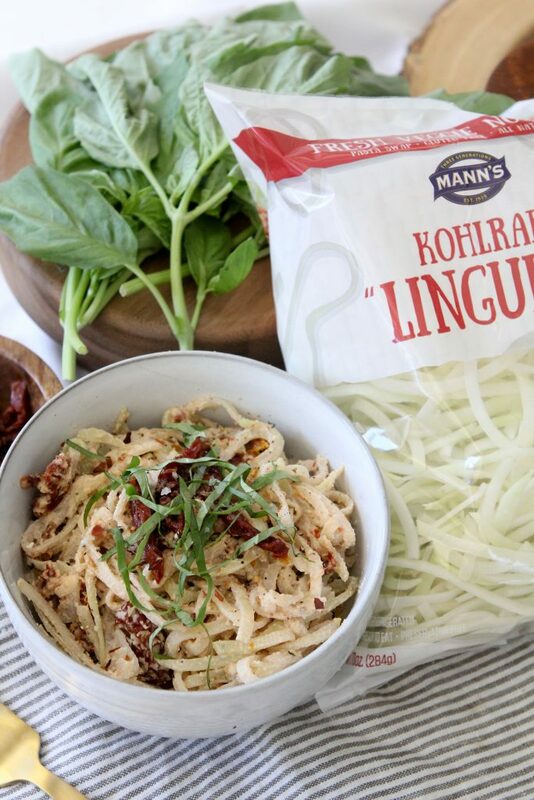 Make sure to use the veggie finder over at Mann’s Fresh Vegetables to see where you can find these kohlrabi zoodles nearest to you. Add the drained cashews to a high powered blender along with the garlic, almond milk, water and salt. Blend on high for 1-2 minutes until the cashew cream has a smooth consistency. Add the sun-dried tomatoes and pulse until they are broken down and combined. You don't need to blend them until they are smooth. Prepare your kohlrabi fettuccine noodles per the direction on the bag. Or optionally, add 1/2 tablespoon to a large pan and heat over medium heat. Once the oil is hot add the kohlrabi to the pan and cook until they are heated through. 2-4 minutes. 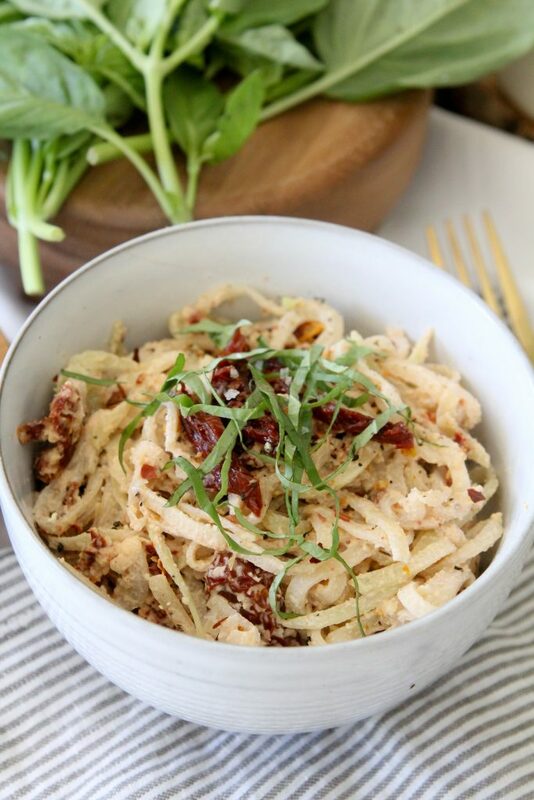 Add the cooked kohlrabi noodles to a large bowl and add the cashew cream sauce and 1/2 of the basil and toss to combine. To serve sprinkle a bit of the remaining basil over top of the dish. This dish tasted delicious. I know the recipe said that the sauce was supposed to be on the thick side, but mine was super thick. Did I do something wrong? Was it really supposed to be 1 cup of cashews and one tablespoon of water? Nope, it will loosen up from the heat and liquid released from the noodles. The cashews would not blend in my vitamix. 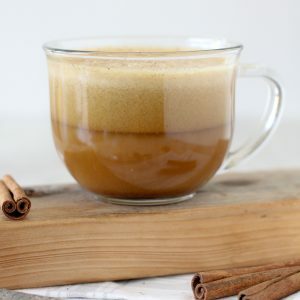 Was I supposed to add more liquid than a tbsp of water and almond milk? No, it will be thick. The heat and liquid released from the squash will loosen it up. Topped this with some bacon and it was insanely delish!! This recipe is delicious! I did have to add more almond milk to get the cashews to blend in my Ninja. I just kept adding a splash at a time until it blended up to a smooth but thick consistency. Also, it was only 2 servings for my husband and I. I added a chopped chicken breast to it to make it the main course. We will definitely be making this again! The kohlrabi noodles aren’t available in my area. 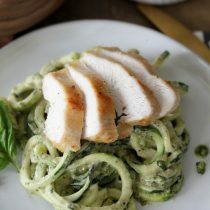 Would this work with zucchini or butternut squash noodles instead? Can I substitute cashews for another nut?? I ran out of cashews! !